Email Marketing remains one of your most effective means of retaining customers and building customer-brand loyalty. 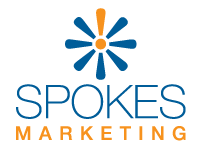 We offer SpokesMailer, a fully-customizable email marketing service that provides an easy way to send hundreds or thousands of e-mails to your opt-in database. Email Marketing can be your best way to garner new customers and remind current customers of the value that you can provide. Spokes Marketing can help you by setting up your Email program including adding your entire spreadsheet of contacts to the database and creating an initial template for you to fill in. Busy? We can write content and load it into the template AND send the emails for you. We have several customers that we work with that desire and enjoy this level of support. We look forward to helping you with your Email Marketing project! Are you keeping in contact with current customers and reaching new ones?